This project is an exciting, top-down, fighter game with cool 8-bit graphics. Coming into this hackathon we had a small amount of experience with multiplayer applications, and knew we wanted to make some kind of browser based game. The idea started to evolve as we went and we really fell in love with our game and its mechanics. Adventurer's Conquest is something that we built as we were going. Our team had some ideas from the get-go, but as we got deeper into the project there were increasingly more ideas for features that would make the game cooler, more exciting, and more appealing to the eye. Just to name a few features that we were not expecting to add at the beginning of this project: random map generation, random terrain generation (including obstacles like trees and bushes), full head's up display (HUD), and external controller support. 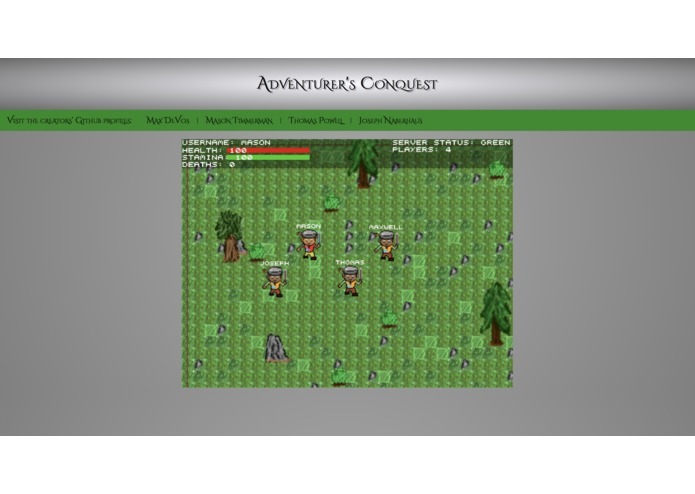 You are able to natively use Xbox 360/One controllers in Adventurer's Conquest and using a third party application called JoyToKey, you are able to use a Nintendo Switch full controller or single JoyCon. We made it our goal to make a game unlike a run-of-the-mill 2D game that you would see all over the internet. The real reason behind the creation of the game is to have made something to entertain people and in that process, hopefully inspire them to make something great using the seemingly infinite list of web development tools out there by showcasing just a few. This is a project that we all enjoyed working on and we can't wait to share it with our judges today! 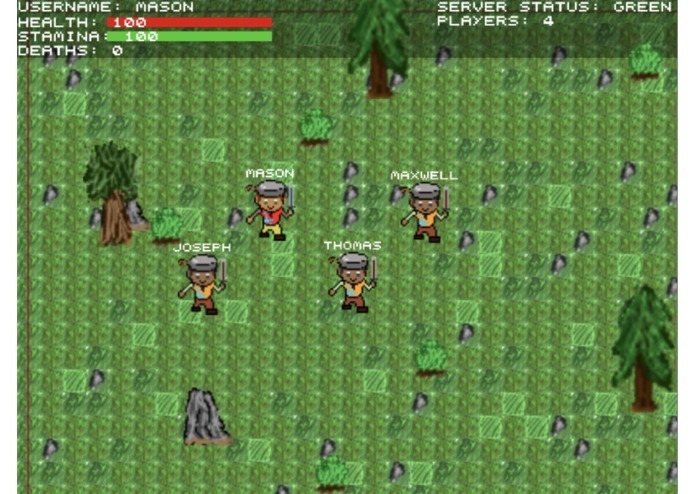 I am sure we will entertain you with our 2D, 8-bit, top-down, PVP fighter game, Adventurer's Conquest! I was mainly in charge of creating graphics and music, including some that weren't implemented in the initial product. I also found out how to configure keys to a Nintendo Switch Joy-Con and play the game with it.